Happy Hour! Is there a single phrase on earth that is…well, happier? Happy Hour is the magical time of day when drink and food specials abound at bars and restaurants all over the world. But don’t just settle for any Happy Hour–seek out the best! If you’re in San Diego, you have to visit us for Happy Hour at The Pool House. It’s undoubtedly one of the most memorable Happy Hours not only in the Gaslamp Quarter, but in the city! It’s for more than just one hour. Happy Hour is an hour so nice, we want to repeat it twice! For many people, one hour of happiness is not enough. After all, an hour is barely enough time to get settled, enjoy a drink, and start a conversation with your companions! At The Pool House, we understand that sometimes, you want to not only get happy but stay happy, so our Happy Hour is extended and lasts from 5-7 each weekday. You read that correctly: during Happy Hour, oysters are just a buck a shuck. That’s a screaming deal! During Happy Hour, select appetizers are offered for 50% off. 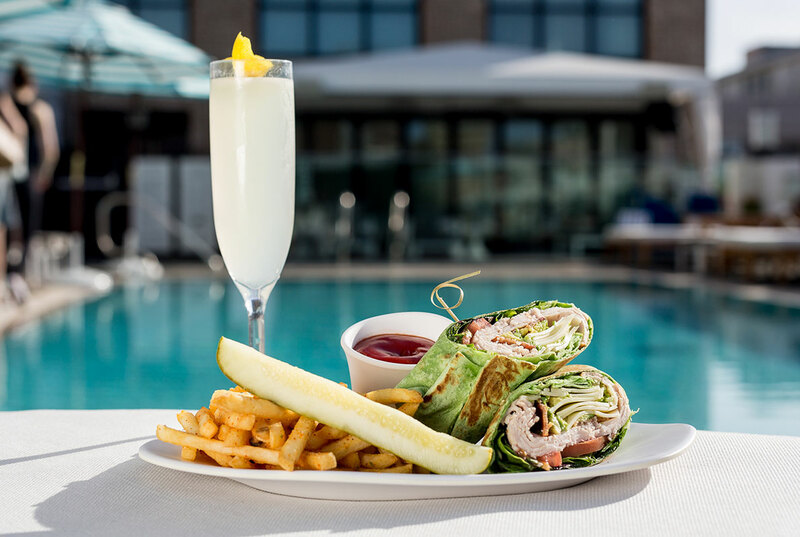 Enjoy our fresh, light and expertly prepared poolside fare for fantastic prices! Drinks are the name of the game at Happy Hour! You can enjoy select cocktails for 50%. That means the price is right for a second round! The Pool House is located in San Diego, where the weather is almost always pool-friendly! In our fair city, the average year-round temperature is 72 degrees: not too hot, not too cold, but just in the perfect middle. Since we have plenty of sunshine and good weather, The Pool House is open all year round. That means that in addition to one of the best lunches in the city, we also have one of the best Happy Hours that can be enjoyed at any time of year! 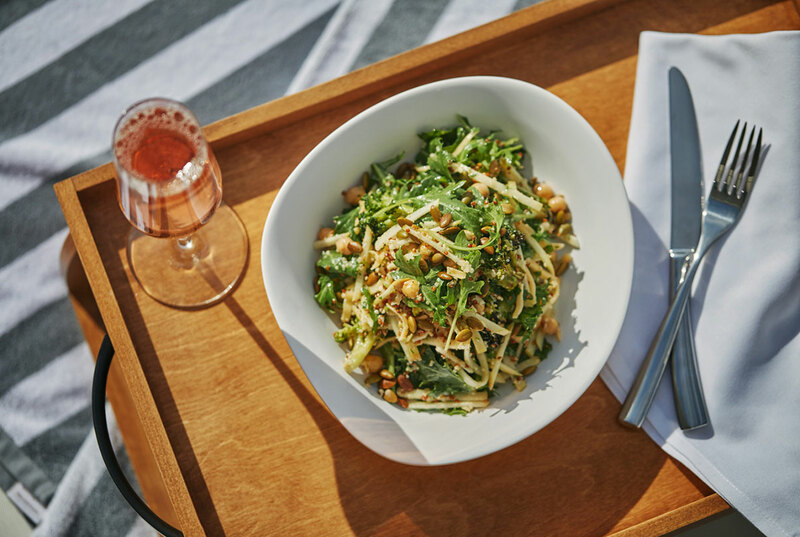 You’ll love basking in the sunshine during our Happy Hour. What you enjoy during Happy Hour is important, but where you enjoy it is important too. The Pool House is a rooftop bar that is located on the premises of The Pendry San Diego, and is largely considered one of the city’s hidden gems. When you emerge onto the rooftop, you’ll be afforded beautiful views of the Gaslamp Quarter and downtown San Diego. So go ahead, treat yourself: enjoy the gorgeous late afternoon light, cocktail in hand, during our epic Happy Hour. Bring your friends, and your phone, because these views are absolutely Instagram-worthy! Cabana and daybed rentals available. Want to enjoy The Pool House in VIP style? Consider reserving a daybed or cabana to really live the luxe life. This is one of the best ways to enjoy The Pool House in style! Your reservation comes with plenty of perks, not least of which are that you won’t have to wait in line! 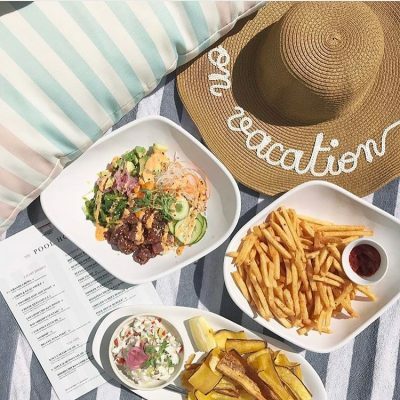 After a long day of lounging by the pool on your reserved daybed or in a reserved cabana, Happy Hour is the perfect time to venture over to the bar and enjoy some great food and drink specials! The Pool House is a magical hidden rooftop bar. It feels like an oasis, but in fact, it’s right in the middle of all of the action of the city! The Pool House is located in the bustling and vibrant Gaslamp Quarter, a small but mighty neighborhood that is practically brimming over with incredible dining, shopping, people watching, nightclubs, and culture. Happy Hour is one of the best times to catch up with friends and enjoy drinks and food at incredible prices. At The Pool House, we take Happy Hour very seriously and strive to offer one of the best ones in the area to keep our customers happy and satisfied! We hope you’ll join us soon for our incredible Happy Hour at The Pool House. Bottoms up! Have you tried Happy Hour at The Pool House?